This lovely cottage is situated on 2.3 acres and is a 4 minute walk to the ocean beach. A pond beach, which is ideal for young children, is only a 6 minute walk away. On the top floor is the living room which includes a fireplace, dining area, large pantry closet, TV (with cable and a DVD player), and full bathroom. The kitchen comes fully equipped and has a gas stove, microwave, and dish washer. The dining area has a dining table that seats six. From the living room, you can walk out to a sunny deck with stunning ocean and pond views. The first floor has two bedrooms; one with a queen and the other two twin beds. There is also a utility room, and full bath. In the back is a beautiful south facing brick patio with garden and outside shower. Ceiling fans are found in the master bedroom and top floor; the other bedroom has a window fan. Other amenities include Wi-Fi, beach chairs, towels, and a charcoal grill. This is a quiet and idyllic setting in Nantucket's most lovely area. Please no pets or smoking. During the high season, mid June thru the end of August, we rent only by the week (Friday to Friday). 1 full bath downstairs; 1 shower upstairs; outdoor shower near the patio. Nantucket town is 7 miles away with restaurants, cobblestone streets and many galleries. The Massachusetts Estuaries Project identifies Sesachacha Pond as one of the island’s cleaner bodies of water and it is Nantucket’s largest and deepest kettle pond at 43 feet. Beach and pond views from cottage deck. Less than 5 minute walk down private path to ocean and 3 minutes to pond. Both are public beaches. Dinning area sits four and can accommodate six. Two full book shelves and a take one leave one policy. The 2nd story deck has beautiful water views and both the deck and patio have sunny southern exposure. The cottage is located in Quidnet which is a quiet part of the island favored by summer residents with second homes. It is charming and beautiful with uncrowded beaches. At night the sound of the waves can be heard, and the stars are breathtaking. The house is only a five minute walk to the beach on one side and the pond on the other. It sits high and has views of the beach and pond that can be seen from the deck. We've been renting on Nantucket for the past 11 years and have rented this cottage for the past 5. The cottage is always clean, fresh, and bright. The views are lovely and the property is beautifully maintained, serene and private. We walk to the beach and or Quidnet Pond (5 min walk) on a daily basis and the proximity to both is unique on Nantucket. We rent for three weeks each year which speaks to our level of satisfaction. That said...this cottage and its location make it truly a gem! I just want to say what a delightful time we had spending a week at the Nantucket cottage on Squam Rd. in Quidnet. So I was surprised to see the letter to VRBO that was so critical. Our experience was quite the opposite. Everything was fully equipped. We had no trouble finding the lobster crackers or forks, or anything else for that matter. We separated the trash with no problem, as we do at home. I can’t imagine not doing so. We had total privacy, spending almost every night either dining on the deck or on the patio completely alone. The cottage itself is delightful, with lovely paintings and other decorations. It is comfortable and has great views of the ocean and pond. There are many good books to choose from for reading. The ocean was less than a five minute walk and our kids had a wonderful time at the pond, which was also less than five minutes away. The landlords were great. They went out of their way to make sure we were comfortable and that all was OK. They told us if we had any questions or needed anything to just let them know and they would take care of it. I’m not sure what the complaints were about, but for me and my husband we could not have had a better time. When you go to take the trash out in your pj's and will point out that you didn't do the recycling correctly, or, be working in the garden around your "2.3 acres of complete privacy" and point out that your daughter trampled her flowers ( for which she went over and apologized). There is nothing wrong with any of this, but it is not what it was advertised as being. I rented this house because of the privacy that was repeatedly mentioned, and found anything but, at least the minute you leave the back yard. This is just plain misleading advertising. Also, the "well-stocked kitchen?" Not so much. No tall or large drinking glasses; lobster pot, yes, but without claw crackers or pickers, hardly useful. Tv should be in a museum and only watchable from two feet away. A dangerous raised step into one of the bedrooms caused a serious fall for two of us and when I suggested to the owner that caution tape be added for future guests, I was told they they had never had a complaint about this before and clearly it was our problem. Also, every where you look is a laundry list of "don'ts" which is hardly welcoming or makes one feel that the owner is happy to have you enjoy their "2.3 acres of complete privacy." dishonest and unethical, especially for the weekly rate being charged. We are sorry our tenant did not enjoy her stay in our cottage. We are also sorry she got her facts a little mixed up. Indeed, we do use the garage, but only to store and retrieve garden tools. We don’t “work” in it and we are careful not to open the door until 9 AM at the earliest. We are not quite sure why she alluded to us as retired as both of us work full time. It must have just been another assumption. Had the tenant bothered to read the cottage guidelines she would have seen that sorting the trash is dictated by town rules - not ours. In fact, if it is not properly sorted, it will not be picked up. The flowers, which the tenant never offered to replace, were destroyed by her daughter and friend in a rather bizarre incident. The two girls snuck out the window at night by removing the screen and climbing out the window, crushing the day lilies as they did so. Apparently, they were on their way to go skinny dipping and didn’t want the tenant to know, or so we were told. We are a little mystified as to the tenant’s observation that there is no privacy. 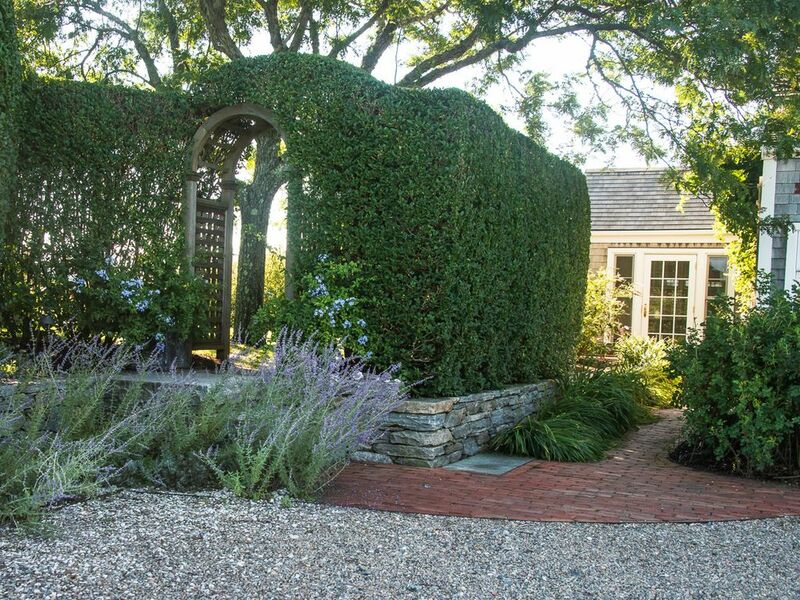 The fact of the matter is that there is a ten foot tall privet hedge between the cottage and main house and the cottage is built on a separate lot. There is a private patio and garden behind the cottage with vegetation all around it. We are also mystified that the tenant said there were no lobster utensils. Had she just asked us, which she did not, we would have shown her that they were in a drawer next to the kitchen sink where we found them after she left. Finally, we are sorry the TV did not meet her standards. We assumed, perhaps incorrectly, that people come to Nantucket to enjoy the outdoors and even some summertime reading. In any event, we are pleased that we have the chance to clear up any misconceptions and welcome tenants who enjoy privacy, a fully equipped kitchen, lovely grounds and peace and quiet on 2 plus acres. This two bedroom two bathroom cottage is located a two minute walk from the pond and children's beach and 5 minutes from the ocean. It is situated on 2.3 acres overlooking wetlands. There is a brick patio in the rear with a butterfly garden. We rent only by the week Friday thru Friday, from June through September. In October, shorter times are available. No Pets, no smoking.